Dr. Holm received her Bachelor of Elementary Education from the University of West Florida (Pensacola, FL). After teaching elementary school (grade 2 and 3) in Florida for one and a half years, she moved to Tennessee where she taught grades 4 and 2 for four years. She moved back to Ontario where she received her master’s degree from Lakehead University (Thunder Bay). She also continued to work in schools as first a volunteer through a mathematics organization in the area and then as an occasional teacher and long term occasional teacher. She received her doctorate from the Joint PhD program at the Lakehead University campus. After teaching kindergarten for an entire year, she took a contract position at University of Alberta for a year before joining the Wilfrid Laurier faculty. Dr. Holm’s research focuses on the knowledge and beliefs of both preservice and in-service teachers in mathematics. This research looks at identifying beliefs and how they support how mathematics is taught, as well as ways to possibly change or challenge beliefs to support teaching mathematics as experiential and connected. Interconnected with the beliefs a teacher holds are how personal knowledge of mathematics impacts teaching and ways to support developing a more specialized knowledge of mathematics. The current portion of Dr. Holm’s research examines how experiences, in particular traumatic ones, in previous mathematics classrooms impacts future teachers within a teacher education program. Her courses and research focus on uncovering the sources of anxiety and making steps towards healing through experiencing mathematics through modeling and problem solving. 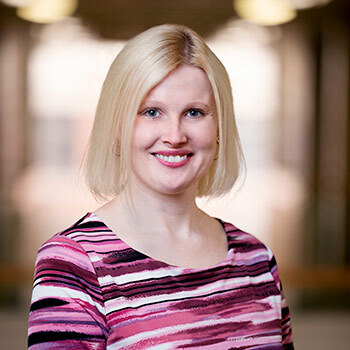 Dr. Holm teaches courses in the Bachelor of Education program—EU 418: Mathematics Education (Primary) and EU 419: Mathematics Education (Junior).